When I walked into the Intercontinental Hotel on Front Street yesterday, I sort of knew what to expect from the Fan Expo. I’ve seen pictures from the hundreds of ComicCons that happen around North America every year. I knew there’d be fans dressed in costumes while wandering around various movie and TV show props (I touched the Batmobile – I died). I even expected to see a familiar face or two from both the big and small screens. What I didn’t expect was the size of this behemoth of a show. It is sprawled out over an immeasurable amount of space in both the North and South towers of the Metro Toronto Convention Centre. There are hundreds of booths and interactive sites offering looks into upcoming games and some fun movies like Lego (yes, its happening and I think it’s going to be awesome). There were people selling everything from t-shirts, games, toys, comics jewelry and some of the most creative art I’ve ever seen. Life size models of R2-D2 from Star Wars and several Daleks (sharp tongued robotic bad guys) from Dr. Who buzzed, quipped and beeped their way around the crowd. There really is nothing cooler than seeing R2-D2 zooming around in real life. I was impressed and overwhelmed (in a good way) with how serious people are about their love for their heroes. The costumes are nothing short of super, crazy and cool. My favorites were the two Autobots I spotted on my way out yesterday. If I were four years old, my dream would have come true at that very moment. I hope to see Linda Hamilton over the weekend. She kissed me on the cheek once when I told her I used to watch Beauty and the Beast with my mom in the 80s. She loved me for not calling her Sarah Connor. Maybe I’ll nerd out. Maybe I won’t. 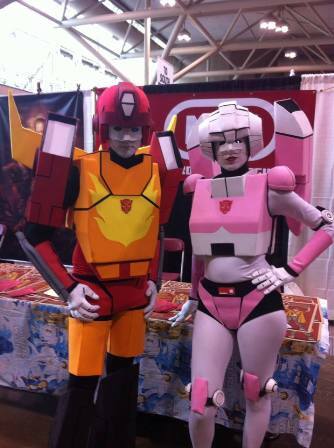 Next Article Fan Expo Canada Recap, Day 2!